2018 marks the 70th anniversary of the Universal Declaration on Human Rights. On 10 December 1948, Members of the United Nations General Assembly came together to declare that all people, from all nations, deserved fundamental human rights. The UDHR was created to ensure the respect and uphold the dignity and rights of all individuals. Those rights include the right to life, to be free, to be granted recognition under the law, to name but a few. All of these rights were to be granted without distinction of any kind (article 2). 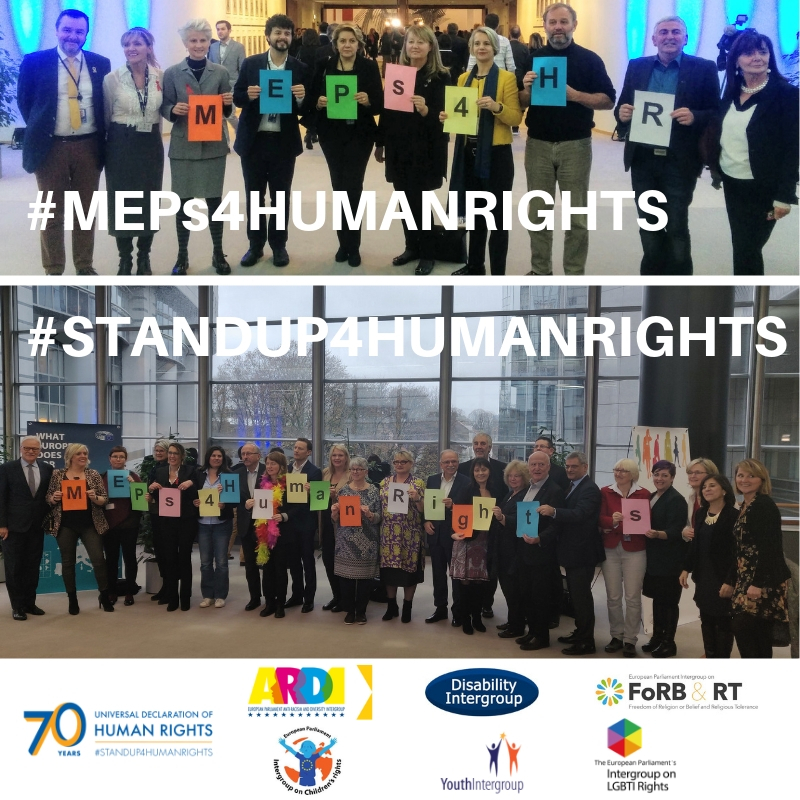 As co-chairs and members of Intergroups in the European Parliament dedicated to the access to rights of specific groups, we cannot stress enough how much there is to be done to realise the vision of the UDHR in the world today. 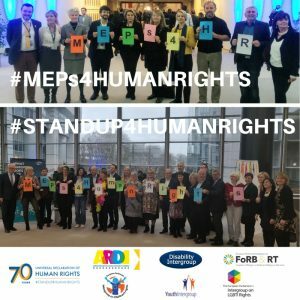 In Europe people are still discriminated against or denied access to their rights and not enough action is undertaken by governments, parliaments, institutions and judiciary to put an end to this. Today, with the growing threat of nationalism and populism, we must reinforce our commitment to upholding and safeguarding the human rights of children, youth, people with disabilities, people of colour, people with or without a religion or belief, LGBTI people and other marginalized or vulnerable people. In particular people who belong to one or more of these groups are at risk. That is why we call for an intersectional approach. In times where the rights of minorities are increasingly questioned and endangered and multilateralism is under increasing pressure, we, who are dedicated to universal human rights, must work together. That’s why we are willing to act and come together to stand up for human rights regardless of our political leanings. Standing up for human rights means not only speaking out but also leading the way. That is why we call on our fellow EU policymakers to mark the 70th anniversary by passing the Horizontal Equal Treatment Directive. On the international stage, the EU advocates the shared values of liberty, democracy, respect for human rights and fundamental freedoms. Yet we have failed to put in place a comprehensive anti-discrimination framework. This is quite simply wrong. We should be ashamed that in 2018 some people can be discriminated and they have no access to legal remedies through the law. We ask you, is this the Europe we really want to live in? The UDHR was created in response to the Holocaust, in which more than six million innocent people were murdered, many because of their faith, ethnicity, disability, sexual orientation or gender identity. We said never again. To extremists and those questioning universal human rights, our message is simple; never again. We will not compromise; we will tirelessly defend one of the greatest achievements of humankind of the twentieth century.